Turtle of the Day - "I need a bigger bed"
So where is the turtle in all this? Hidden behind the Munchkin is his Yertle the Turtle - you can just make out his blue shell to the right of the Munchkin. (Left of Chicken) This is one of his new buddies. (Bonus - there are also turtles on the pillowcase of the small pillow). 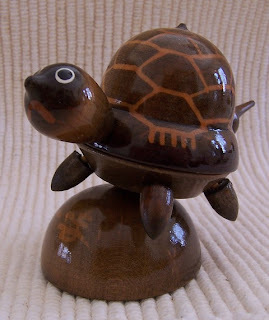 Turtle of the Day - "Topsy"
"Topsy" was a fun find. I was on a trip in Japan and found this in one of the gift shops in Kyushu. I was a teacher in a girls public high school in Kanazawa from 1990 - 1993. In the fall of 1990, the 11th graders went on a school trip, traveling south from Kanazawa, stopping in Nagasaki, Beppu, Kobe and a few other places in between. I was one of the teachers who joined the class on this trip. I was fortunate - because I already had strong Japanese language skills one of the teachers had gone to bat with the Vice Principal and convinced him that I could serve as a chaperone on this trip. Other American teachers had wanted to go in the past, but due to their lack of language skills the Vice Principal thought they would be more of a burden to the other teachers than an asset to the trip. This teacher - an older gentleman with limited English skills, taught Physics - and took a shine to me right from the first day I was introduced to the teachers. In fact his conversation with the Vice Principal took place within the first 2 weeks I was there. He helped me improve my language skills, got me involved in all sorts of activities in the school that normally I would have been left out of, and kind of became a surrogate "grandfather". My daily routine at school included a visit to his office for "tea and conversation" and I learned much from him. "Topsy" reminds me of him. Each part of this turtle is a top - including all 4 legs, which I did not remove in the 2nd picture as they are really tiny. Yes - I have had all parts of this spinning - the tail is the hardest as it is so long and narrow, but it can be done. I also like how the artist made a little base for this to perch on - and the base is a top, too. And the red and yellow design on the inside was an unexpected treat, since the outside color is not that bright. This is one of my favorites in the collection. Lazy Sister Sue and I are doing a long distance "quilting bee" - we chose the same pattern, and swapped some of our fabrics to use in the quilts. So far that's been the EASY part. Might I just add that if you are doing 9 patches -Bonnie's instructions with this pattern are GENIUS! Especially with scraps -I knew exactly what I needed, and had very little waste! I also finished 20 blocks in 2 hours - with a break to fold 2 loads of laundry! And you all will just have to wait on the rest. I will just have to keep an eye out for something like this for our dining room. Turtles were not the only critters in residence last weekend - there were a few "bugs" as well - but their presence only lasted as long as it took us to cook and consume them - which was not very long at all. Baked crab stuffed lobster and homemade sourdough bread. Nana would have enjoyed that meal! 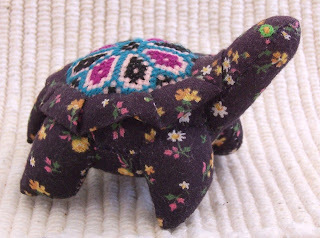 I got this Turtle at a toy store - somewhere - I think it was in Japan but I am not sure. I can see the store in my mind - but not quite clear enough to figure out the details of where and when. Do you ever remember things that way? Try to see a "photograph" in your mind? Usually I am good at that - I can remember where I read things by where on the page it was, or visualize myself doing something and remember where it happened. It does not always happen on demand, though - sometimes I have to think of something else and then the memory will creep it's way back in. They say there are different kinds of learners - those that hear, those that read, and those that physically experience - but most people are a combination of these. I think I am a mix of a read and experience type person - I remember a lot of what I read, but especially with crafting skills I do better with a video, or step by step photos and tutorials. And when I put puzzles together I rely heavily on what it is SUPPOSED to look like. No picture - and I will give up. At least with this little guy (or should I count this as 2 turtles???) there are no other ways for him/them to fit together. 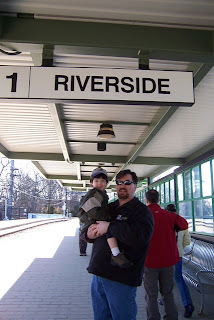 Turtle of the Day - ...and a train ride! OK - so this Turtle is not exactly part of MY collection - he is part of the collection at the Boston Museum of Science, where we spent the better part of Easter Sunday. 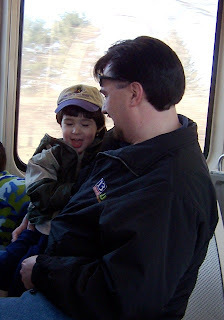 The Munchkin got his first major ride on a train - 5 trains to be exact - and experienced both "interurban" and "subway" modes of transportation! He was so very excited! Unfortunately the pictures did not turn out so great. Exhaustion got the better of him, though, and he fell asleep on the last train of the day as we headed home. We had a great time at the museum, and were especially surprised at how relaxed and enthused he was in the snake and lizard display, considering the trepidation he has shown about some of the snakes in a few of his books. At one point he was nearly nose to nose with a Burmese Python (well - with THICK glass in between) and the python was moving towards the glass. He was not startled in the least, and wanted to "help" the snake because he thought he was stuck! He liked the walking Chameleon (so did Mommy) and a small stuffed Gecko is now part of our collection of "buddies" - named (what else?) - "Gecko". He's so original! I won't be online for a long weekend, so thought I would give you a bonus "turtle of the day" to tide you over until I am back on Tuesday. 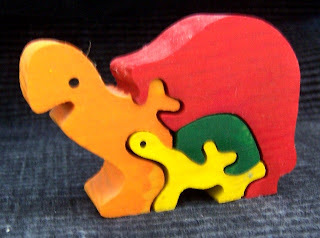 These are actually not turtles- but other things I found in the box. 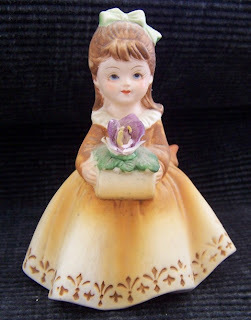 One was my "violet girl" - a February themed porcelain doll that was on my dresser for YEARS. I cleaned her so often that the lettering wore off, and her violet has lost a few petals, but otherwise she has weathered the years well. The other item is my Heinz Pickle Pin. The photo of this did not turn out well, so this is a better one I found online. My mom had always told me about one she got when she was a kid (perhaps at the 1939 New York World's Fair, but I may be wrong) so when I got to go to the 1982 Worlds Fair in Knoxville I had to be sure to get my own. I was so excited when I got one - but now it's just languishing, an oddball in the land of turtles. Perhaps I should send it on to Mark Lipinski at Pickle Road- I am sure he would appreciate it! Isn't it amazing what we save??? The sidebar photo is a bit tiny, so here is a bigger picture. See the sidebar article for all the details. My Lazy Sister Sue and her friends are quite a group of ladies. I wanted to introduce them to you, and let you know what they are doing for the American Cancer Society. This is an important charity to my family, as Mom is a survivor and cancer has touched our extended "family" - both relatives and friends as well, not always with a happy ending. These are the Busy Bees. 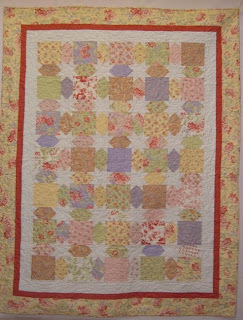 They are a group of friends, primarily quilters, who have all been touched by cancer. Three of the members are cancer survivors themselves, the rest of them have had a close family member or friend who was diagnosed with cancer. They dedicate fundraising efforts to their memory and honor. 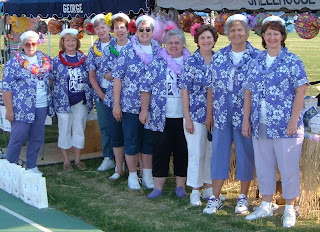 The group participates in the American Cancer Society Relay for Life each year. In addition to pledges, they put their talents to use by raffling off a quilt***, and selling various craft items that members have made. In addition, they have put together baskets to raffle and sold luminaries that line the track the night of Relay. 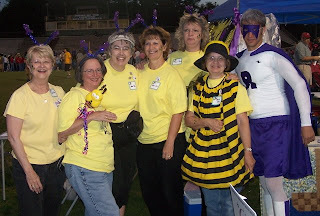 Last year the Busy Bees raised over $10,000! Please consider donating to have a luminary made in honor or in memory of someone. Luminary donations are $10 or $25. They also are going to have special luminaries for pets, because animals get cancer too. Pet luminaries are $5. *** Check back later today to view this year’s quilt and buy your raffle tickets. We will be accepting PayPal. In honor of the Busy Bees quilt raffle, I thought I would feature this little guy, as he is "almost" quilted. He is made out of fabric -but stuffed very tightly so he stands up nice and "tall" (by turtle standards anyway) and his back is cross stitched/embroidered. To be honest - I have NO recollection of how, where, or when this little guy joined my Turtle family. If you were the one who gifted him to me, please accept my apologies at my faulty memory and set me straight. Each year I try to add to our Christmas Ornament collection with something significant for that year. When Hubby and I first got engaged, we went on a camping trip and took a day trip to Lake Placid. The snowflake ornament we picked up that year is a mainstay on our tree. We've added many along the years, and pulling them out each year is a little walk down memory lane. So when we started doing major renovations on our house right around Thanksgiving one year- which included totally gutting the kitchen (4 layers of wall, 7 layers of floor, and tons of icky nasty gunk above the ceiling) I found this little handyman turtle by Harmony Kingdom. The tiny workbench says "Santa" and the head screws off to reveal a tiny little box. Somehow he never made it onto the tree, though. He looks too cute sitting on the window frame. Maybe when the renovating is all done I will move him to the tree. 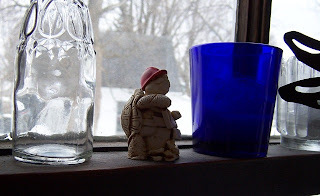 The Munchkin is a bit under the weather today, so I decided it would be nice to feature his turtle - this little guy was purchased just before the Munchkin was born. It has a mirror on it's belly, and a clip so it can hang from the bars of a crib or playpen. Turtle hung out in the crib until the Munchkin was about 1, and then it found its way downstairs into the play room. He liked to look at himself in the mirror and stuff the legs back into the shell. Responding to a request to share more of my turtle collection, I have decided to start posting a "turtle of the day" and share the stories behind each one - where I remember them. You will have to forgive the photography - these were taken on the fly between The Munchkin's pleas to "play with the trains, Mommy" so a few ended up a bit blurry. Or maybe it's just my eyes. 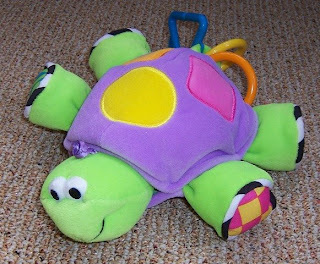 I thought I would start with one of the largest turtles in my collection (not counting the Munchkin's turtle sandbox!) 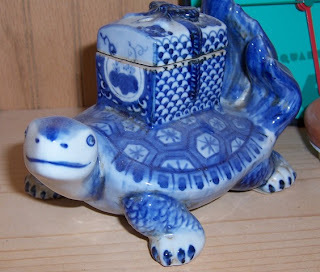 - this is a Kyoto porcelain turtle. I have no idea of the age of it, but I got it at an antique flea market at a temple in Kyoto in 1992. One of my American friends in Kanazawa found a book called Japanese Accents in Western Interiors that listed a whole bunch of temples all around Japan that held these regular weekend antique flea markets, so one weekend we bought train tickets, made some hotel reservations, and went to about 6 different markets in 3 cities. 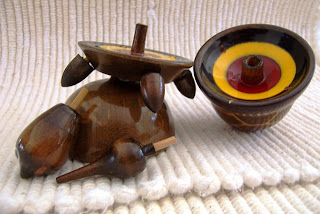 We got kimonos and silk fabrics, wooden chalk line tools (sumitsubo) and, of course, turtles. The haggling was the fun part - I think this one started out at about $80, and I think I eventually paid around $30 for it. The turtle has a feathered tail - I have notes somewhere explaining the significance of it and will edit with that information when I find it again. The box on it's back is actually an incense burner - you would fill it with sand and stand the incense sticks up in the sand, then replace the little lid when not in use. This little fella got nearly first class treatment when I returned home in 1993 - I was so afraid he would get broken in shipment, or in a suitcase, so he was very carefully wrapped in paper and a few tee shirts and came along in my carry on bag along with all the negatives of all the photos I took during my 3 year stay. Needless to say it was a VERY heavy bag and probably would not meet today's standards!!! Tune in tomorrow for the next edition of turtles! 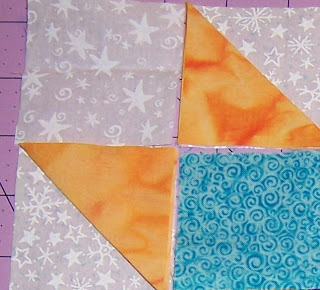 Whoever came up with the concept of "chain piecing" quilt blocks was GENIUS!!! And thank you Lazy Sister Sue for teaching it to me! 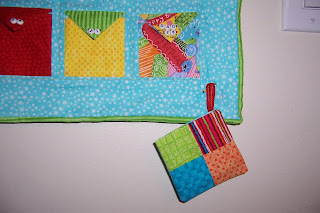 I use it all the time - making Lazy Girl totes and wonder wallets, making quilts, sewing curtains for The Munchkin's room. Saves time, saves thread, and it makes these fun little "banners" - especially working with 1 1/2 inch squares! Last night I sewed 102 of these little pairs for the Christmas Quilt project - which has expanded to 2 quilts and 4 wall hangings. I did the calculations and found I need about 100 of the quilt blocks (I have 62 done) and somewhere around 900 of the little square/muslin square pairs. I have around 400 of those done. (I know exactly how many - but I just don't have the paper in front of me right now) . 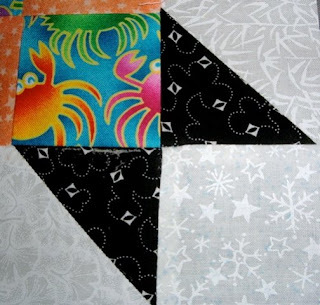 The other GENIUS is strip piecing! I've been cutting up scraps for this quilt, so sometimes I have no choice but to cut those little 1 1/2 x 1 1/2 squares, but wherever I can I have been cutting 1 1/2 inch wide strips, and sewing them to the muslin strips. I know I have about 200 squares just waiting to be cut apart. The funnest part of this project has been the fabrics - going through my own stash and remembering projects past, seeing fabrics from friends and family and wondering what kind of projects they started out from, seeing how all the different fabrics "play nice" with each other. So what's the story behind the turtles? I sometimes get asked why I have so many turtles in my projects. I have bees, too - but the whole "Queen Bee" connection to that is more obvious. Lazy Sister Sue has turtles in a lot of her projects, too - but that goes back to a close encounter with a sea turtle in Hawaii -and that's her story to tell. My turtle connection goes back to my first trip to Japan - waayyy back in 1985-86, when I was a Rotary Youth Exchange Student in the beautiful city of Kanazawa. That entire thing is another looong story, but suffice it to say I had a great time, and even went back later to teach. The turtle "trouble" started when my class took our class trip in March to a number of historical sites around the Nara region of Japan. One visit was to a lighthouse, and I found a couple of cute tiny little turtles carved out of seashells in the gift shop. I purchased 2 - one purple and one white -giving the purple one to my best friend. The little white turtle came home with me - and I showed it to my mom. The following Christmas - there was a carved wooden turtle in my stocking. This was larger than my shell - but the same shape and design. Mom had found it in a local antique store. The turtle collection had begun - although it grew slowly. I really did not add to it too much until I returned to Kanazawa, and then I began adding turtles from around the region - a jade one from China, a soapstone one from Hong Kong, an antique porcelain incense burner one from Kyoto, and a fun one made entirely of carved bamboo tops - it all comes apart and each part of it spins! My rule was to purchase turtles particular to where I was. So when I ever get to Austria I will get the Austrian Crystal one - but not before then. I really don't know how many I have- or what they all are. It would be interesting to get them all together and take a picture. I don't have them all out and displayed -they are tucked here and there around my house, and some are still in storage, waiting for the right time to come out of their "shells." My most recent "turtle" is my Miranda bag -with fabric given to me by Lazy Sister Sue. At least this one I can take with me wherever I go. Perhaps the little guy that started this all will find a home in one of the pockets. For as long as I can remember - back even when I was a kid - I have always loved the Sunday edition of the newspaper. Whenever possible, I have always liked to read the ENTIRE paper, cover to cover, as part of my Sunday morning ritual. As I grew older and developed a taste for coffee - Sunday mornings have usually started with a hot cup and a fresh paper. My hubby knows that this little thing makes me happy - so he always lets me get to the paper first. 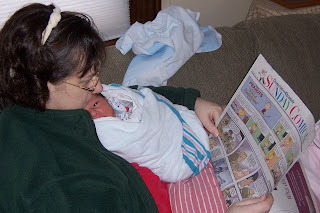 Even The Munchkin's first Sunday of life was spent in Mommy's arms as she read the Sunday funnies (although our paper got interrupted that morning by the arrival of SC Gramma and Grandpa, so the full experience had to wait a week or so). Even now he's learned to respect Mommy's time with her paper. So on days like today - when the paper is not waiting outside the front door when I get downstairs - I am thrown off kilter. The snowstorm and daylight savings time combined to conspire against my Sunday ritual. So instead we had homemade coffee cake (The Munchkin helped), and enjoyed the sunshine after the storm. And the paper just got delivered -and now all is right with the world! At least for now. A week ago the Prolific Online Quilters started a database "wishlist" of scraps and strips that we each need for our various projects. And suddenly the US mail was filled with little "squishy" packets of goodness as we all shared our stashes and scraps - I even have a pile started to send to Poland! My first squishy arrived in the mail yesterday. A week ago these strips were sitting in Barbara's stash in Texas. 12 more blocks rapidly followed, and this project is well on it's way! Can't wait to see what today's mail brings. I'll admit it - I used to sleep with a teddy bear - in addition to the Grandma Quilt I have already talked about. Over the years I have actually had a few different bears, and I still have a few of them, although they no longer sleep with me. One my hubby gave me, and others were adopted at different times for different reasons. 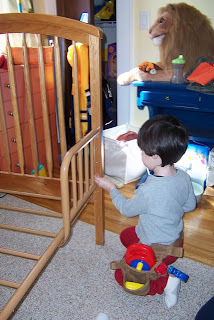 The Munchkin currently has a whole crew that share his crib - they don't go far from his room at any other time, and when we travel overnight somewhere only one comes along - but each night and at nap time he makes sure they are all there. That and the half dozen blankets. We washed them yesterday - and he gave them each a hug when they came out of the dryer. All together they make a Super Duper Double Munchkin Tent at nap time - until he pulls them all down and makes a nest to curl up in. 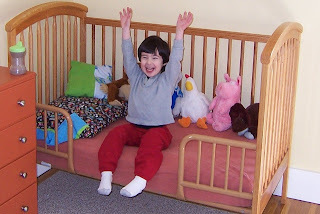 I wonder as he gets older if he will remember his blankies and buddies as fondly as I remember mine? 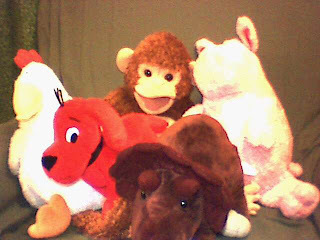 At least we have a picture of his buddies for posterity... and such original names: Pig, Chicken, Monkey, Clifford and Sera (short for Triceratops). I started out with a good list - new rotary cutter, blades, thread, and some fabric for a couple of quilt projects I am working on. I was fine until I got in line for the cutting counter -and got spotted - by 2 of my Sister-In-Laws and my niece. "There's nothing purple in this cart," one SIL observed. The other SIL had been hinting BROADLY that the Train Miranda I made for the Munchkin would look really good in purple, so I knew what that was all about. I'd been intending to make her one, but since there were so many fabric styles to choose from I did not want to buy it without her input. Since the quilting fabrics were on sale - I grabbed the 3 of them and off we went back over to get more fabric - just as my number was being called for cutting! "I'll be back" I promised the ladies at the cutting counter. So we found our purples - and back I went to get it all cut. It must have been my lucky day - I had grabbed a whole bunch of bolts that had just enough on them that after I put in my order, there were "remnants" left that I of course snatched up at the additional discount. So I ended up with enough purples to make 2 Mirandas (and I just happen to know someone else that is related to me that loves purple!! ), and enough of the other bits and pieces to really get to work on 4 quilt projects in various stages of progress - from planning to piecing. AND I got my new rotary cutter. I got lots of great input from lots of people on the different cutters out there, but in the end opted to stick with the same Fiskars cutter I am used to. I've had no complaints, like how it feels in my hand, the price was right - and this great new color in their Coastal Collection will help me keep my paper cutter and fabric cutter separated. I obliterated the gift card Hubby gave me for my birthday - and then some - but will get a lot out of what I purchased. I just can't go back again for a while - unless I win the Lottery. The plan is to add a decorative button for that loop to hook around so we can add the extra pocket for Leap Years (and pin it to the back for safekeeping on the other years) and to add a heart button or embellishment to Valentine's Day (red pocket on bottom left of this photo). I also need to get more beads or iron on numbers or something, because the Munchkin was quite distraught that he could not find "29". He will be even more distraught tonight when he realizes the pockets are put away until next year and the seemingly unending stream of new train cars and other goodies will cease - at least for now. There are still 2 unopened in the closet for a special occasion - the rest are all over the play room floor - keeping a little boy VERY happy!